The AFP New Mexico Chapter is committed to investing in the philanthropic sector in New Mexico through AFP membership. 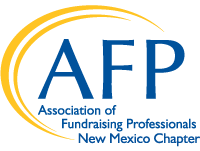 AFP membership scholarships are available by application to any fundraising professional who is interested in joining AFP New Mexico and has a financial need. Membership scholarship applications are accepted at any time during 2019 and will be awarded at the discretion of the AFP Board. Funding is limited so interested potential members should apply early. Applicants can apply for the AFP New Mexico Chapter Membership Scholarship to cover their membership dues up to 50 percent of the total cost of their membership. The applicant or the applicant's organization will be responsible for paying the remainder of the membership fee. Applicants must be employed as full-time professionals in the non-profit or philanthropic sector, and must spend at least 50 percent of their time fundraising. Priority will be given to applicants from small organizations or organizations unable to pay the membership fee. Strong consideration will also be given to applicants who have been actively involved in the AFP New Mexico Chapter and who reflect a broad representation of experiences, perspectives, opinions and cultures. If awarded a 2019 AFP New Mexico Membership Scholarship, recipients are required to attend meetings regularly and are encouraged to serve on a board committee. After your application is submitted, it will be considered by the AFP New Mexico Chapter Board. If the chapter is able to fund the scholarship, we will contact you to pay the required 50 percent of the scholarship. If you have questions about the scholarship process, please contact Vice President of Membership Development Bianca Mitchell, bmitchell@indian pueblo.org.